Welcome to Atomic Tabs, Chew your Energy! In addition to caffeine, Atomic Tabs contains a blend of B-Vitamins, Amino Acids, and essential nutrients. Atomic Tabs contains zero sugar, zero herbal stimulants, and zero calories. And we still managed to make them taste amazing! Just the right amount of sweet and tart, and never bitter. Carry them anywhere and use them any time! 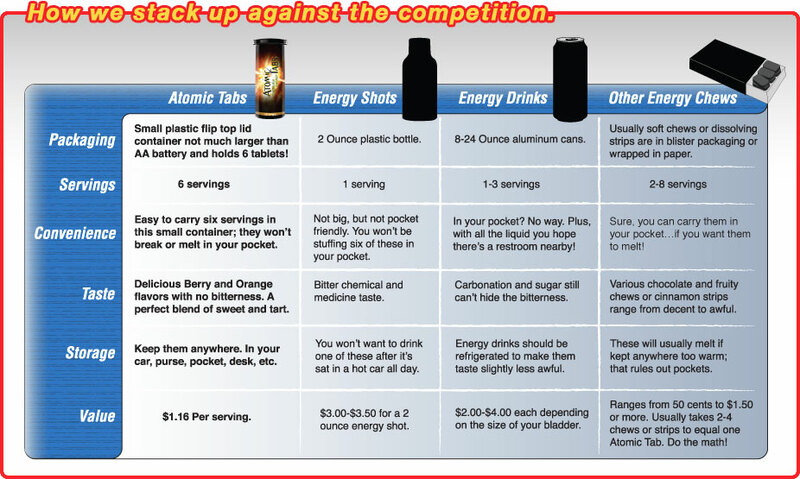 Atomic Tabs packs 6 servings (equal to 6 energy shots) in a container a little larger than a AA Battery! Convenient and easy to carry in your pocket or purse, you can keep Atomic Tabs in your car glove box, desk drawer, gym bag...just about anywhere. Atomic Tabs also won't require the frequent restroom trips energy drinks and shots require due to the amount of liquid contained in those other products (up to 24 ounces!). Atomic Tabs don't need to be refrigerated, won't melt in your pocket or car, won't get crushed in their container, and will always taste great! † These statements have not been evaluated by the Food & Drug Administration (FDA). This product is not intended to diagnose, treat, cure, or prevent any disease.